3 months of travelling fun taking in Tasmania and the coast from Port Fairy round to Cairns before Kakadu and Ayers Rock. Highlights of the trip were Sydney, learning to dive in Cairns, the Blue Mountains and going on a huge wine tour in the Hunter Valley where we visited a dozen wineries spread over 2 days. Each one was happy to provide unlimited free samples. Darwin was hot and sticky but Kakadu National Park was fantastic and probably ranked alongside Tasmania as a star performer. I managed to see some 350 species of birds in Australia which is the highest number I have ever seen in one country. 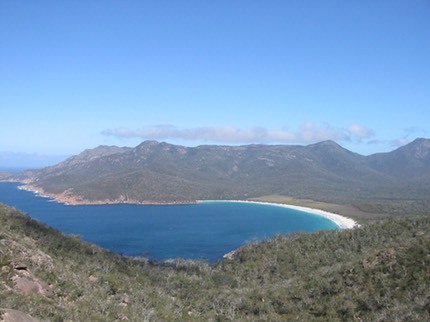 Tasmania was our favourite part of Australia being under-populated and full of wildlife. It also brews the best beer in Australia, the beautiful Cascade. We camped here and had wallabies in the campsites each night. 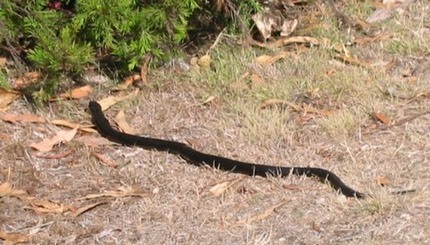 A Tiger Snake that wriggled past our tent. 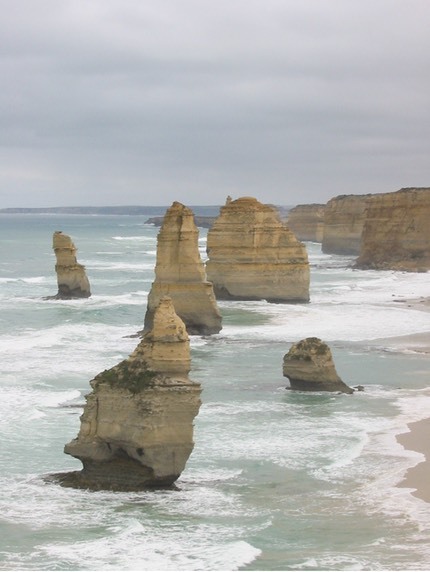 After meeting with friends in Melbourne we drove the Great Ocean Road round to Port Fairy so we could see the Twelve Apostles. There aren't twelve and since we've been home another one has gone (the one in the front of this picture). 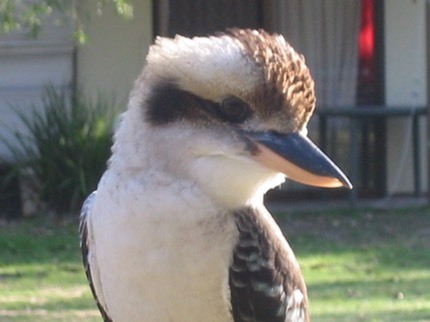 Friendly Kookaburras inhabited most of the campsites we stayed in. This one lived in Bateman's Bay where we stopped for a night and took kayaks out into the freshwater lakes that are behind the town. The number of parrots in Australia is huge and many are quite used to humans so come fairly close. 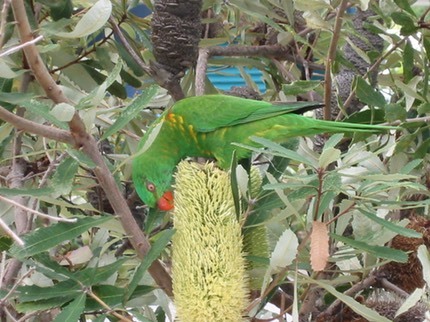 These Scaly Lorikeets came to a flowering bush in the campsite at Surfers Paradise. Surfers was a bit garish and we soon moved on to Noosa which was superb. On a trip out of Surfer's we went to Lamington NP where David Attenborough filmed Bowerbirds. Not 'deep in the jungle' (say in DA voice) but right behind Gran O'Reilly's Bistro. One lump or two David?. 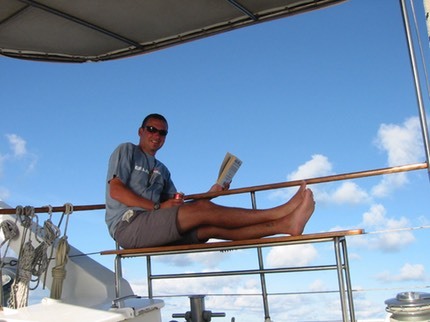 A leisurely 3 days and nights saw us sailing around the Whitsunday on a great yacht called Madison. There were 9 of us on board with two crew and we spent most of our time snorkelling or talking. What more could you ask for. We learned to dive in Cairns and near the end I borrowed an underwater camera to enter the photo competiton. 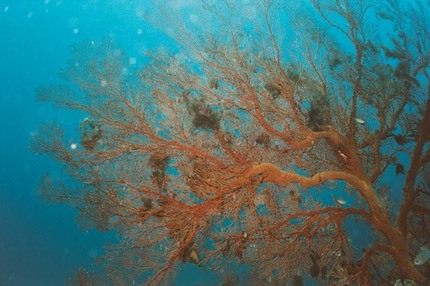 I came second with this great coral picture. The winner managed to get a stupid turtle looking into his camera. Ayers Rock was everything we had expected of it and our tour group laid on a champagne sunset along with about 2000 other people, but it was still good. The visitor's centre here was a bit rubbish as most of the exhibits had sticky tape over them covering up the names and faces of dead Aborigines. It's their custom apparently but leads to a boring set of displays! 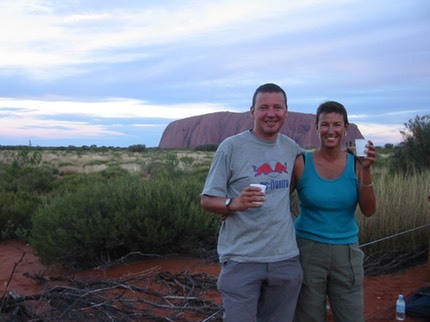 Our second visit to Australia was part of our second extended period of travel. Western Australia was the target area with a good southerly circuit from Perth through the forests and then a huge drive up the coast to Exmouth for some diving. Unbelievable driving distances but some great things to see on the way. 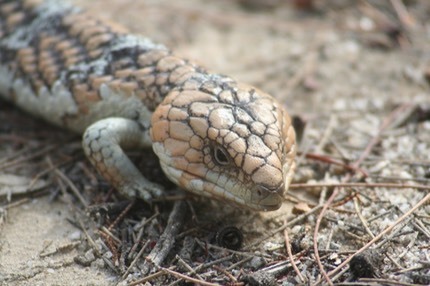 After completing WA we flew to Adelaide and hired a car to head north into the hinterland.This little fella was crossing a path and remained still as I took a number of photos. In general the quality of wildlife in Australia is fantastic with plenty of it and often not particularly scared. We stayed in a lovely park with good birding and a few snakes. 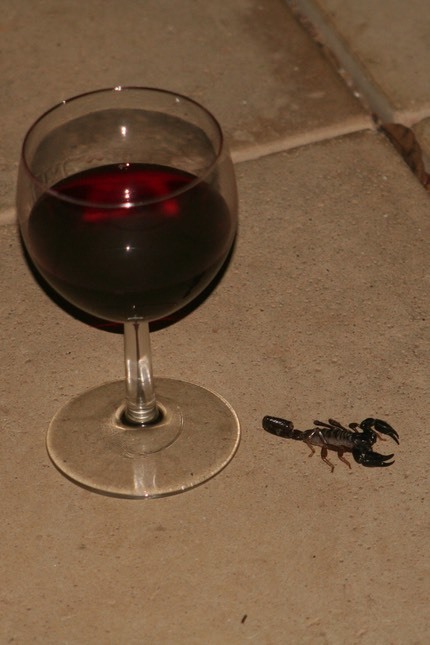 Also in the area were loads of scorpions, mostly tiny, at a centimetre long, but this fine specimen seemed to find the wine quite attractive and hung around for a bit. Also near here I climbed one of the massive fire trees where the tallest in the woods have stakes driven into them and platforms made at the top so at times of fire risk someone would sit up there and look for smoke. It was relatively easy to make the climb up, but going back down was not for the faint-hearted. 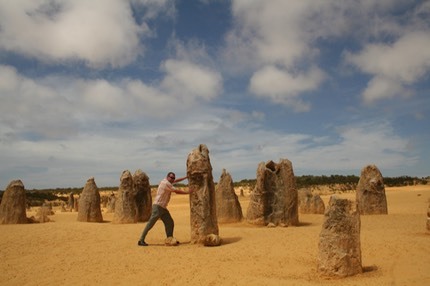 Way up the coast from Perth is a park called the Pinnacles where strange crystalline like rock structures have been exposed by thousands of years of wind erosion. There are hundreds of them and they vary from very small to some over 3m tall. We also found a park with a massive blow-hole. We were generally were driving 800k per day and finding places to stay as we went. You could go a long time without seeing any other traffic. We found this place which had some great marshes for bird attaching and also a massive pier that stretched about a kilometre into the sea. I need to look it up again to see what it was for. 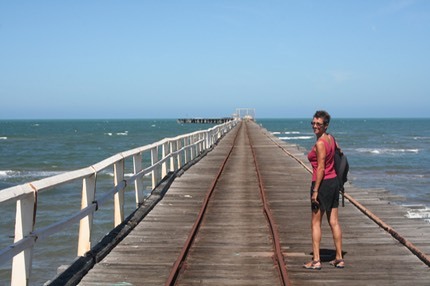 It was Carnarvon and in the middle of nowhere. 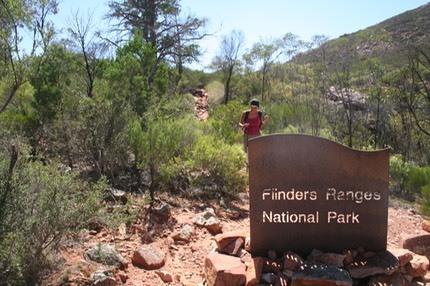 North of Adelaide is the Flinders Range National Park where we were able to take a full days hike, with suitable supplies, which we really enjoyed. It was hot and fairly varied terrain and near the sign where we stopped for lunch, there were tame lizards that lived on sandwiches. 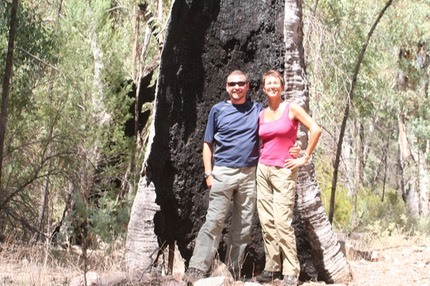 On the way back to Adelaide we stopped at Mt Remarkable National Park. The walking was limited due to the fire risk but we got 2 good short ones in, including this tree that had been struck by lightning.